In August 2016, I celebrated seven years of being cancer-free. Seven years is a lifetime. And it was just yesterday. I was only thirty years old at the time, juggling life as working mom of a toddler and infant. And, oh yeah, training for the Boston Marathon during the in-between. I had exactly two options at the time. I could crawl into a corner and die. Or I could continue moving forward with life. I chose the later. 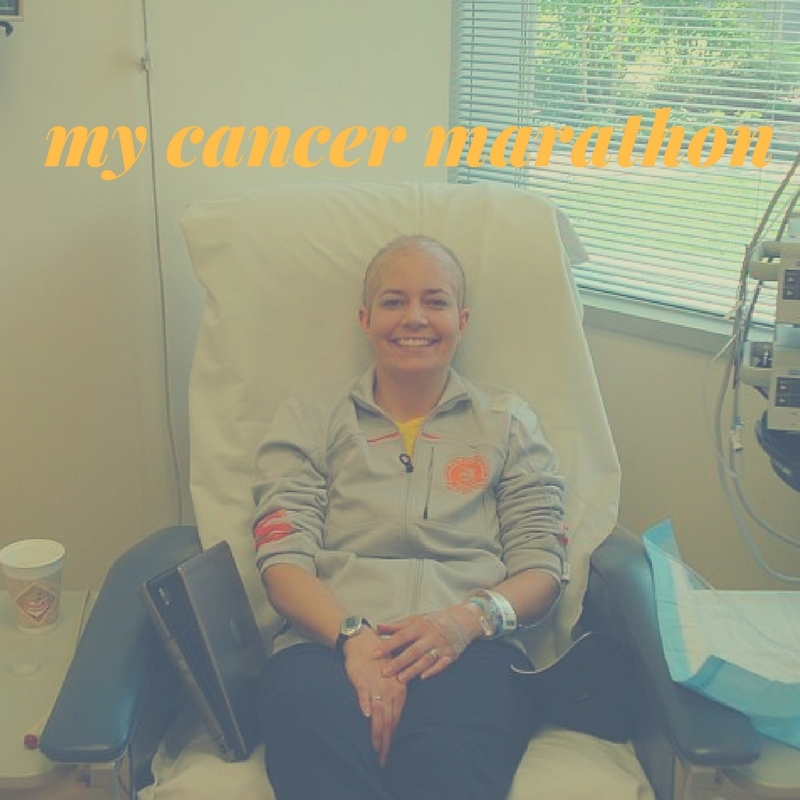 During that time, I chronicled my Cancer Marathon through a series of Facebook posts. I will be re-sharing a few of these posts this month. I hope they encourage you, no matter the difficulty of the life race you are currently running. You never know what you are capable of until you try. So backtrack three days to Thursday morning. My first stop of the day was the Radiology for a check-up X-ray. I did the whole x-ray rigmarole – check in, wait, get changed, wait, get x-rays, wait, change, wait, blah, blah, blah. After you’ve waited for the millionth time, one of the techs comes out and hands you an oversized envelope containing your x-ray films. I’ve had enough x-rays at this point that I’m pretty good at discerning the difference between healthy and unhealthy bone. If I had to judge myself, I’d say I’d be in the 2nd year of medical school level. Not too shabby for being self-taught via the internet. Anyways, I was dying to look inside the envelope and see what my leg looked underneath the skin, muscles, and tissue. But somehow it felt like it would be cheating – like I wasn’t supposed to see the x-rays until the doctor did. It totally reminded me of elementary school when my teachers would give me notes to deliver to the office. I often got selected for this prestigious duty because I was the perfect combination of a brown noser (willing to step up the challenge) and shy (less likely to leak secrets). In a teachers’ eyes, that’s pretty much the equivalent to a lockbox. Hence I was given folded notes (such as “Billy Green is a total pain and driving me nuts. Please arrange a parent-teacher conference ASAP”) to transport from my teacher to the office. What my teachers didn’t know that I am the worst person in the world about keeping secrets. Seriously, never tell me anything you don’t want the entire town of Chagrin Falls, my out of state cousins and the checker at Giant Eagle to know. The entire walk to the office I would be torn between my urge to discover what secrets might lie in my teacher’s handwritten note and my duty to be a diligent student. I must confess that sometimes my curiosity got the best of me, and I sneaked a peek at the notes. But never the whole thing. I usually just lifted up a corner and read what I could. That was how I satisfied my nosiness without compromising (too much) the secrecy of the mission. So back to the Cleveland Clinic. My curiosity got the best of me. I had to look at those X-rays RIGHT NOW and discern if my leg had made any improvement. So like a total dork, I whipped out the films right in the middle of the seven-story lobby of the building, surrounded by hundreds of people, and raised them towards the skylights to render my self-taught medical opinion. After careful observation, Dr. Fontana’s professional opinion was a much-improved bone composition but with some areas still in need of healing. So with that intrigue subdued, it was time to see what the real doctor had to say. The doctor came in and peppered me with his usual barrage of questions. Any pain? Any soreness? Are you taking any pain relievers? Are you limiting your activity in anyway? When was the last time you visited the oncologist? When is your next scheduled appointment? What is the square root of 144? How will we ever stabilize Afghanistan? Then he had me to do the catwalk. I call it the catwalk because he makes me walk across the room, pivot and walk towards him so he can check my gait. Once I have traversed the catwalk back and forth a few times, I end my one-person cancer leg fashion show by striking and holding a pose while he checks out my overall alignment. The whole exercise is silly in many ways. First, my wardrobe consists of my regular streets clothes on top, and a pair of humongous hospital issue scrub type shorts on bottom. Hardly couture. Second, I obviously walked into the appointment on my own two legs so is there really a question about my ability to move? Third and finally, it’s weird to having someone staring at your legs as you strut about. It’s practically one step removed from walking past a construction site while wearing a short skirt. I’m sure it will come as a surprise, but I’ve decided that life as a runway model is just not in the cards for me. My experience with the orthopedic runway has soured me on the profession. Sigh. I guess I will just have to find another career. After the third degree and the catwalk, the doc went over the x-rays. As I had already diagnosed, the leg is healing well but will still need some time to get back to normal. He said that I could continue what I am doing as long as I don’t have pain. As he rambled on and on about follow-up visits and treatment protocols, I was about ready to burst. The words “WHAT ABOUT RUNNING??!! !” were lodged in the back of my throat dying to explode out of my mouth. Finally, when there was a gap in the conversation, I hesitantly asked: “Can I start running again?” For me, the question was so heavy with emotion and deeper meaning that it felt like it sucked all the air out of the room as I said it. So it was completely unexpected, and I was taken back when it was met with a breezy “I don’t see why not” from the doc. He didn’t even look up from his clipboard. And with that, the elephant in the room evaporated. The doctor’s only concern was that I took it “easy” at first. The runner’s definition of easy is a bit different than the rest of the population. We’re the kind of people who say insane things like “I’m going for an easy 20 miler” or “I decided to take it easy and only run 3-mile repeats instead of 5.” So I asked for a further definition, worried that he would spew crazy talk like no more than 10 miles a week for the next decade. Instead, he said don’t immediately start running at the level you were at before you got sick. Give it two months or so. I about peed my pants and was laughing hysterically on the inside. Like after not running a step for ten months I was just going to jump into 60-miles-a-week 3:15 marathon training. Even I’m not that crazy. After I got my metaphorical running permission slip signed, I pretty much bolted from his office as quickly as possible. And with that, it was time to plan my first run back. Like a tween plans their dream wedding, I’ve been planning my maiden running voyage post-cancer with careful consideration, attention to detail and no realism of when it would actually happen. First, it had to be memorable. I couldn’t just slough off a few miles on the treadmill while mindlessly watching the crawl on CNN. Second, it had to be poignant. If you’ve been reading this far you know I am a sucker for repetition and ridiculous metaphors. Third, it had to be for me. While I am so grateful for everyone who has assisted me on this journey, this is something I had to do on my own. So instead of prince charming slipping a ten karat Princess cut stunner on my left hand, a doc saying “I don’t see any reason why you can’t run” put my carefully orchestrated plan into motion. My last run was on February 14, 2009, at South Chagrin Reservation park. 2:00 hours. Just me and the tree lined trails. It was only fitting that the run that would cap note by cancer journey and restart my running would be again at South Chagrin. Instead of 2:00 hours I would do 20 minutes (once again, even I’m not that stupid to try to run double digit miles after a ten-month break). And I would run by myself, totally for me. The weather was cold and miserable, a typical Cleveland winter day. Pretty much exactly like the day of my last run, minus a foot of snow on the ground. During my cancer journey, I saw winter turn into spring and spring into summer and summer into fall. And here it was, winter again. I’ve shared my innermost thoughts and feelings with you during this whole cancer process, but I’ve kept one huge secret from you. Ok, here it is: sometimes I give inanimate objects personalities and develop personal relationships with them. Weird but true. You now know every last dirty little secret about me. For instance, I had a certain pair of warm, fuzzy socks that I regularly turn to after a tiring day at work schlepping along in heels. We’re pretty much BFFs (best friends forever). They don’t judge that my feet are all gnarly and covered in calluses. Instead, they ask how my day was and envelop my lower extremities in warm, fuzzy love. On the other hand, my laptop and I have a strictly professional relationship and an agreement to tolerate each other but nothing more. My laptop is kind of a wimp and prefers that I delicately place him in my work bag. However, I can’t tolerate wusses so I throw him in the bag with no regard to gentleness. He in return gets back at me by throwing a blue screen of death my way. This power struggle goes on, back and forth, until we both declare a truce. Although the white flag has flown, we still continue to pull passive-aggressive moves on each other. I pound on the keys a little too hard just to annoy him, and he strikes back by makingthespacekeystick. You get the idea. My MP3 player and I have a much more loving relationship although we can have our differences. It’s more of a sibling relationship. We may annoy each other at times, but deep down we respect all we have been through together. My MP3 player has been my partner for many, many hours of runs, keeping me from being lonely and providing motivation along the way. It also has a wry sense of humor. Like playing “Baby One More Time” when I’m about to keel over during a repeat workout. Chumbawamba. Tubthumping. “I get knocked down, but I get up again. You’re never gonna keep me down. And as I was finishing up my run, it did the unthinkable. It played The Killers. Mr. Brightside. My absolute favorite song of all time. Thanks, MP3 player for having my back. I knew the run would be emotional, and it was. What I wasn’t so sure of, however, was how it would feel physically. I’ve tried to stay active the entire time, especially the past few months, spending many a workout in the pool or on the elliptical. But running is a different beast and it hurts muscles you didn’t even know existed. And of course, there was my irrational fear that my femur would snap in two and then a mangy dog would run up, steal it and run into the woods to never be seen again. Thankfully the leg didn’t break, and the wild dogs stayed at bay. It didn’t even hurt, so that was a relief. My muscles did stage a half-hearted revolt but I quickly but them in their place. I didn’t feel very fluid at first. My arms and legs just couldn’t get in rhythm with each other. By about 5 minutes in, though, they got their act together, and I found my pace. By pace, I don’t mean PR, tempo or even jogging pace. (BTW, runners never use the “j” word. But I had to use it for poetic emphasis here. Please forgive me.) This pace was a just stay in forward motion velocity, one hair above walking pace. But slowly the pace crept up, and towards the end even partially resembled running. I even logged negative splits, natch. Yes, I love running, and I missed it all these months. Not being able to run meant something much deeper. It meant I wasn’t completely me – the cancer had gotten me. Now that I can run, I can finally put this whole cancer business to rest. I can do everything I did before – I am back to being me. The cancer is finally gone. It’s entirely fitting that this entry comes at mile 13 – the halfway point of the marathon. The first part of my story is about the cancer and hopefully, the second part will be about much more. I’m not sure yet where the finish line is or even how I’m going to fill those miles between now and then. But I’m thinking and I’m hoping, and I’m planning. The first 13.1 was definitely not easy and something I would never have asked for in a million years. But I am grateful for how it pushed me to do more and be more than I ever thought possible. I’m excited to see where the next 13.1 takes me.